Here in Sturbridge we escaped much of the wrath of the recent ice storm that paralyzed much of Worcester County and beyond. Just a couple of miles east of us on the Mass Pike there are broken trees on the side of the highway in Charlton. The damage is far worse north and east of us. Mary headed out early that day to go to work in the heart of the damage. Her boss called the house looking for her, and she spoke to her from her car just as she was heading north up I-190. Her boss told her that nobody else from their department was able to come in that day, things were in Emergency mode, and she would be the only one there from her department. She told her that she should turn around and go back home. So, after crawling, white knuckled to where she was, north of Worcester, she found an open exit ramp, and turned around towards home. One of the amazing things about Mary is that she is not only dedicated to her job, but brave as all get out. That drive must have been one nerve wracking ride. She called me on her way and described the damage she was seeing on the side of the road. It would be a long time before the damage was cleaned up, and power restored to everyone. On Sunday evening, on my way down the Pike towards work in Boston, there was a caravan of out of state utility trucks from Indiana heading east. I know National Grid heads out of state to help others in a disaster, but it is always nice to see the mutual help when it is our turn, and they came from all over. In Fiskdale, all we got was a lot of rain. 4 inches or so, I'd estimate. The stream behind the house was gushing from the culvert under my neighbors driveway, and the stream itself grew 25 feet across. 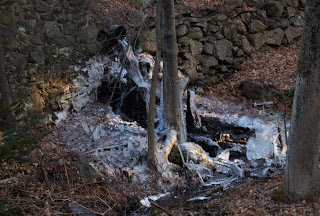 The following morning, the splashing of the water from the culvert exposed the frozen artwork that had occurred overnight. As pretty, and fragile as it was, it was a reminder of just how bad things were just a few miles away from here. Most of us here in town were spared during this last kiss from Nature, but the winter hasn't even officially begun, and there will be other storms, more ice, and more snow to come.